The Big Ten Conference is the oldest Division I NCAA college athletic conference. The Big Ten Conference was conceived on January 11, 1895. On that day, the Chancellors of the University of Chicago, University of Illinois, Lake Forest College, University of Minnesota, Northwestern University, Purdue University and University of Wisconsin met in Chicago to discuss the regulation of intercollegiate athletics. The eligibility of student athletes that attended the universities was one of the main topics of discussion. The following year, the predecessor to the Big Ten, the Intercollegiate Conference of Faculty Representatives was founded. Lake Forest was not at the 1896 meeting that established the conference and was replaced by the University of Michigan. The University of Iowa and the University of Indiana joined the conference in 1899, followed by Ohio State University in 1912. The first reference to this organization of institutions as the Big Ten Conference was in 1917. The University of Chicago discontinued its football program in 1939 and withdrew from the Big Ten Conference in 1946. Chicago still continues its relationship with the conference as a member of the Committee on Institutional Cooperation. In 1950, Michigan State University joined and the conference was again known as the Big Ten. The Big Ten Conference’s membership would remain unchanged for the next 40 years. In 1990, the Big Ten Conference voted to expand the conference to 11 teams, and an invitation was extended to Penn State University. With Penn State joining, it was decided that the conference would continue to be called the Big Ten, but its logo was modified to reflect the change. The number eleven was disguised in the areas around the blue Big Ten lettering. In 2011, the University of Nebraska joined the Big Ten Conference bringing the conference membership to a total of twelve schools. 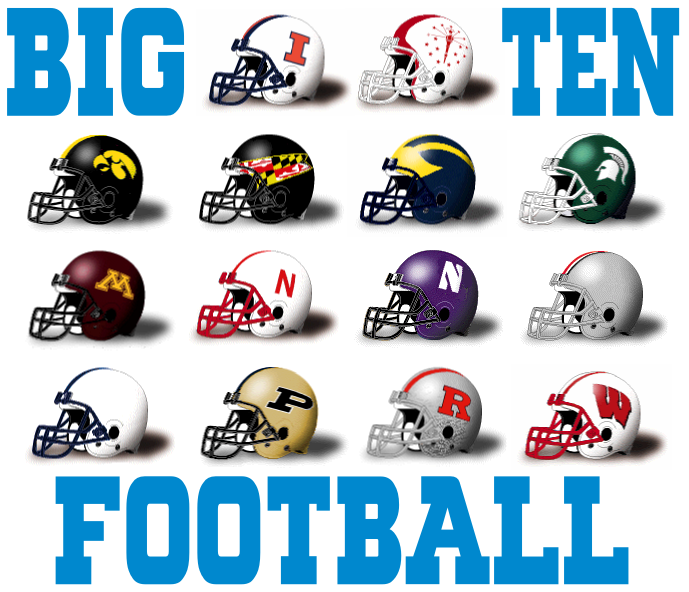 The Big Ten logo was also updated to reflect this change. The Wisconsin vs Minnesota football game is the most played rivalry in Division I-A football, with 115 editions dating back to 1890. The Big Ten Football Championship Game is held by the Big Ten Conference each year to determine the regular season champion. The champion of the Legends Division plays the champion of the Leaders Division. The first championship game was held in Lucas Oil Stadium in Indianapolis in 2011. The Wisconsin Badgers won the inaugural Big Ten Conference Championship Game against Michigan State. Since 1946, the Big Ten Football champion gets a berth in the Rose Bowl game against the Pac 10 champion. The Rose Bowl is now a BCS bowl. The Big Ten also has affiliations with six non-BCS bowls. Picks are made after the BCS selections. If two Big Ten teams participate in BCS bowls, the bowl with the #2 pick will have the first pick of the remaining teams in the conference.